Among the thousands of immigrants who have been coming across the U.S.-Mexico border in recent months, many are seeking to escape gang and drug violence raging in their homelands. The weapon of choice used to intimidate them? Often an American-made gun. While the flow of drugs and immigrants into the U.S. has been well-documented for decades and become a regular part of the political debate, what is often overlooked is how gangs and drug cartels exploit weaknesses at the border to smuggle guns from the U.S. into Latin America. A 2013 report by the University of San Diego says the number of firearms smuggled from the United States was so significant that nearly half of American gun dealers rely on that business to stay afloat. On average, an estimated 253,000 firearms each year are purchased in the United States expressly to be sent to Mexico, the report said, the vast majority of the sales originating in the border states of California, Texas, New Mexico and Arizona. Once in Mexico, the weapons end up in the hands of drug cartels or get shipped to gangs in Honduras, Guatemala and El Salvador — countries that are dealing with an epidemic of gun violence. Armed holdups on public transportation are a regular occurrence in Honduras, where nearly half of the unregistered weapons originated in the U.S., the federal Bureau of Alcohol, Tobacco, Firearms and Explosives reported in recent years. Gun violence in El Salvador is so rampant that the country has been averaging more than one shootout a day between police and gangs this year, said Ricardo Sosa, a criminologist specializing in gangs and security in El Salvador. Mexico last year recorded its highest number of murders in nearly two decades, with more than 31,000 people killed, higher than even during the country’s drug war in 2011. It continues unabated with an average of 88 people killed each day in the first five months of this year. The bloodshed in Guatemala, Honduras and El Salvador has been a big driver of immigration into the U.S., with the government saying nearly 16,000 families came across the border in August alone — many of them from those three countries. Gun-control groups contend that the U.S. government is essentially exporting gang violence to Latin America with permissive gun laws — which in turn creates an immigration crisis along the border. “If the Trump administration were serious about wanting to stop refugees from fleeing violence in Latin America and Mexico to come north, they would be doing something about the southward gun trafficking that is fueling a lot of that migration,” said Adam Skaggs, chief counsel with the Giffords Law Center. Gun-rights activists say the issue is overblown and mischaracterized. The National Rifle Association and other gun-rights groups contend the most effective way to combat the problem is not with stricter gun laws but by eradicating drug cartels and other criminal enterprises. They say the numbers are inflated and that the industry has proactively sought to educate licensed gun dealers on how to detect “straw purchases,” in which a firearm is bought expressly to give it to someone who otherwise would not be able to legally own a gun. Under the Obama administration, federal authorities launched an operation dubbed Fast and Furious that allowed criminals to buy firearms with the intention of tracking them to criminal organizations. But the ATF lost most of the guns, including two that were found at the scene of a slaying of a U.S. Border Patrol agent. In 2011, gun dealers along the border states were required to report to the ATF anytime someone purchased two or more semiautomatic long guns in a five-day period. President Donald Trump issued an executive order in 2017 as his response to gun trafficking, directing federal agencies to ramp up prosecution aimed at going after foreign criminals and to improve coordination among federal agencies along the border. Nabbing the guns at the border is a challenge on several levels. They aren’t as detectable as drug shipments, and they can be disassembled and loaded with legal goods making their way from the U.S.
“The effectiveness of this kind of gun smuggling still remains very high. It doesn’t take a whole lot,” said David Shirk, one of the University of San Diego report’s authors. 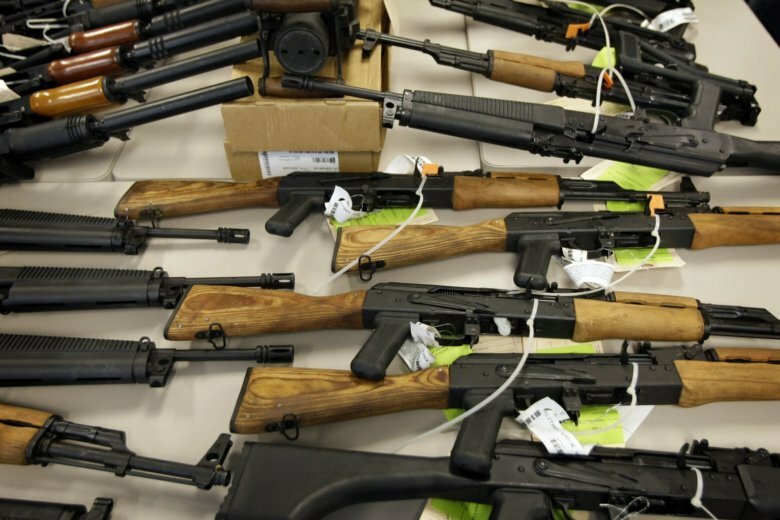 Experts say a big reason gun trafficking remains one of the hot commodities flowing from the United States into Latin America is profit. Retired ATF agent Bernard Zapor noted that an AR-platform firearm that sells retail in the U.S. for $1,000 can fetch more than $4,000 in Mexico. A box of ammo that might go for just under $200 could command $3,000. Associated Press writer Marcos Aleman contributed to this report from El Salvador.